11/16/11 Edited to say: For those of you who just can't get enough quilled snowflakes, here are three more free quilled snowflake patterns! 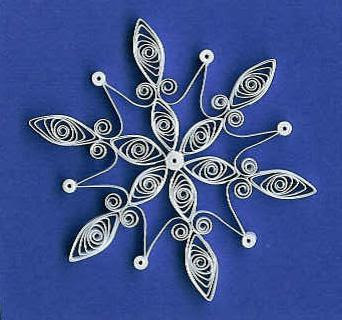 Today I'm featuring the beautiful snowflakes of two quillers I've had the pleasure of getting to know through the North American Quilling Guild (NAQG). 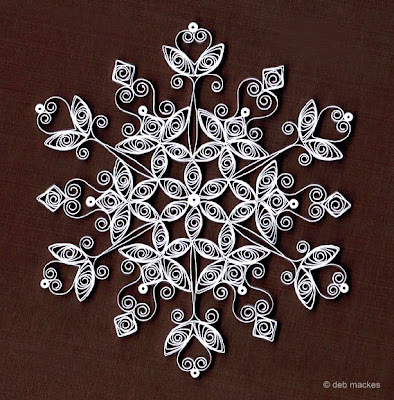 Deb Mackes of Pennsylvania is a pro at making snowflakes... in fact, she doesn't even use a grid to ensure an even layout. Mind boggling! No doubt practice makes perfect, but Deb must possess an especially even gaze and steady hands. She enjoys coming up with unique designs and has treated us to a pattern for this pretty little one. Glue the 3 inch marquises evenly around the 2 inch tight coil. Glue a V scroll in between each marquise, making sure the tops of the V scrolls meet each other. Glue the 4 inch marquises where the V scrolls meet. Glue a tight coil to the base of each V scroll. 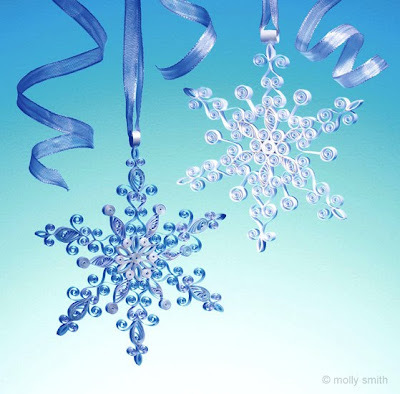 Molly Smith of Texas made these powder blue, silver, and white pearl beauties for Today’s Creative Home Arts magazine. The blue and silver one is extra special in that the two colors are rolled as one. Molly is always coming up with great ideas... in fact, she's the author of the clever and colorful book, The New Paper Quilling: Creative Techniques for Scrapbooks, Cards, Home Accents & More. My wooly winter hat is off to Deb and Molly... as much as I love to quill, I have to admit I find snowflakes somewhat tricky to make. Simply captivating though, they're often one of the first projects a new quiller will try. My best advice is to take your time to make the layout even - the oohs and ahhs will make it well worth the effort in the end. Oh these are so gorgeous. 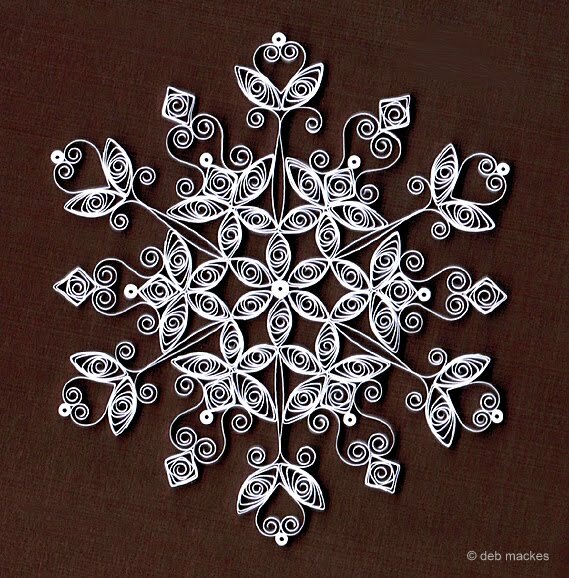 Thanks for sharing the tutorials too... now maybe I will make snowflakes that are worth bragging about! Lordy, these are all beautiful! Thank you for all the beautiful pictures, and the tutorial! Wow, those are truly breathtaking! So inspiring and lovely! 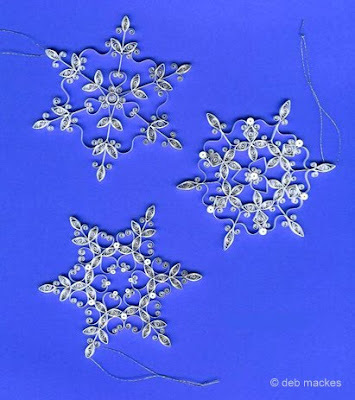 Thank you so much Ann for putting a spotlight on my quilled snowflakes. And to mention my book is like gold to me! Lovely... I've always been a huge fan of Deb's flakes! I hope this is the only type of snowflakes to be seen! Thanks so much for sharing Deb, Molly & Ann. Those are gorgeous I can't get over it! These are gorgeous! I'm looking forward to trying my hand at this in the coming year, with the goal of topping all of my Christmas presents with gorgeous things like this! the snowflakes are just amazing, classy Xmas!!! I was just looking at these again, and they really are stunning. I'm working on my list of things to accomplish in 2010, and attempting something like this is on it! How gorgeous! !Oh, your work makes me wish I had more time to pursue this craft! Thanks so much for sharing all of your projects. I will definitly check in often :) Happy New Year! I'm just getting started with quilling and have a question about quilling on cards. How do you protect the quilling from getting crushed when you mail a card? Hi Ginnie and thanks! It's best to mail a quilled card in a bubble wrap envelope, but first sandwich the card between two sheets of lightweight cardboard so it doesn't bend. You might also check out these box-envelopes that are great: http://www.allthingspaper.net/2012/01/box-envelopes-giveaway.html Linda, the shop owner, is on vacation this week, but after that I think it will reopen. I am new to Quilling and have fallen in love with it. The first thing I tried was the snowflake and the problem is getting it positioned correctly. I am getting better but have a way to go. Cards are much easier but those beautiful snowflakes on my Christmas tree are magical. Ann, your work is beautiful. Over Thanksgiving weekend I shared a quilling lesson with my 98 year old mother-in-law. She is in love as well and will be getting quilling supplies for Christmas. Thanks again for sharing! Hi Sylvia, I'm delighted you're enjoying quilling. Snowflakes are beautiful, but they aren't easy for the very reason you mentioned. If you aren't using a grid, here's one that should help a lot: http://butterflies.heuristron.net/pictures/snowflakes/SnowflakeGrid.pdf Just slip it under a sheet of clear acrylic and glue your coils following the lines. Thanks Ann, I can't wait to try it!